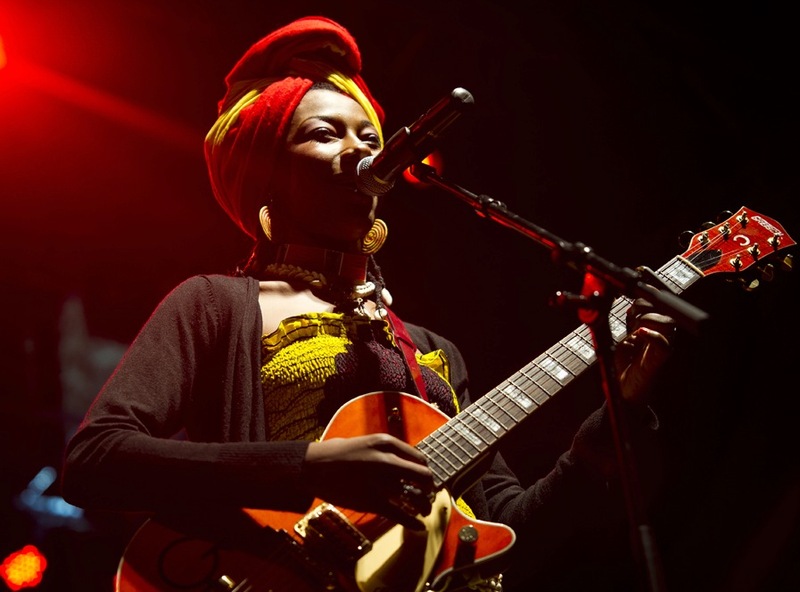 Get acquainted with the captivating sounds of Malian singer and musician Fatoumata Diawara before she performs with her band at the Cedar Cultural Center this Friday, April 12. Copresented by the Walker, the show begins at 8 pm. Fatoumata Diawara has something to say. Or sing rather. Although I don’t speak her language (Wassoulou), I can’t help feeling that she has something important to express. Perhaps she is suggesting new ways of thinking and feeling about each other (and our world)? Maybe she sings about life in Mali? For me, I am simply drawn in by the music itself. With effective simplicity, much of her work functions like a train running on its track. These songs groove at consistent tempos until arriving back to their introductory seed. When listening to this music, I am struck by its relatively neutral harmony, creating feelings which are neither obviously happy or sad. At the forefront, Diawara has an insistent and animated voice, occasionally sending out speedy rap-like melodies or pentatonic embellishments. Second to the voice, the guitars are catchy, and regularly display angular and intervallic motifs. For this LISTENING MIX, I’ve brought together the afro-disco chants of Dur-Dur Band, the intricate sound tapestries of Argentinian singer Juana Molina, the sunny pop-riffs from all-female Indonesian group Dara Puspita, and others.